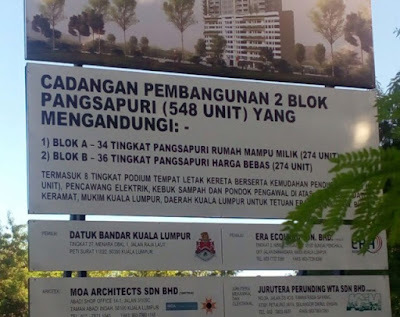 LATEST: Why did City Hall turn down UDA's proposal to build sub-RM200k homes at the contentious Kg Datuk Keramat site? 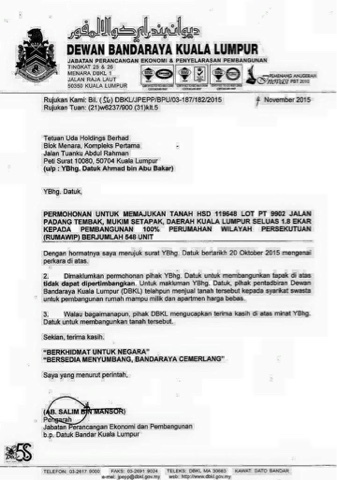 A Titiwangsa resident blogging as Pusak Gagah does not have the answer but provides proof that UDA did make that offer to DBKL in writing ... and was rejected!! Read the scoop, H E R E.
A tiff between residents and local authorities usually don't end well for the residents. Especially if the residents are low-end citizens - taxi drivers, labourers, petty traders, unemployed grads - and the authorities concerned happen to be backed by well-connected businessmen or developers. I've seen it happened many times when I was with the newspapers, especially when I was heading the Malay Mail in 2001-2006. In one case we were covering, even Bangsar's most affluent stood no chance against this gang of cronies who had found a new hobby, i.e. running restaurants and decided they wanted to open up a row of cafes and diners in Bangsar. The RA protested strongly and at first the residents had access to the media and the support of their wakil rakyat but in the end they were up against powerful people with access not just to the PMO but to the PM himself! So the residents got thumped and the cronies went on to build their little diners and cafes right at the residents' doorsteps! But that wasn't the end of the story, you see. The angry Bangsar folks took up their fight to the ballot boxes during the next general election. We in the know have always believed that the incident involving this small group of self-serving cronies was a major contributing factor to Shahrizat Jalil's shock defeat in Lembah Pantai to first-timer Nurul Izzah in the 2008 polls. The row of crony restaurants in Bangsar has since closed down but Lembah Pantai remains with PKR until today. The case involving Kampung Datuk Keramat residents protesting the proposed development of two high-rise luxury apartments in their midst reminds me of the crony restaurant story. Keramat's residents are lower-income folks up against the Mayor of Kuala Lumpur and the mighty City Hall. And a newly-set up housing development company with purportedly no previous experience in building homes, which led people to smell something fishy about the whole thing. By right, it would have been a classic David vs Goliath case. 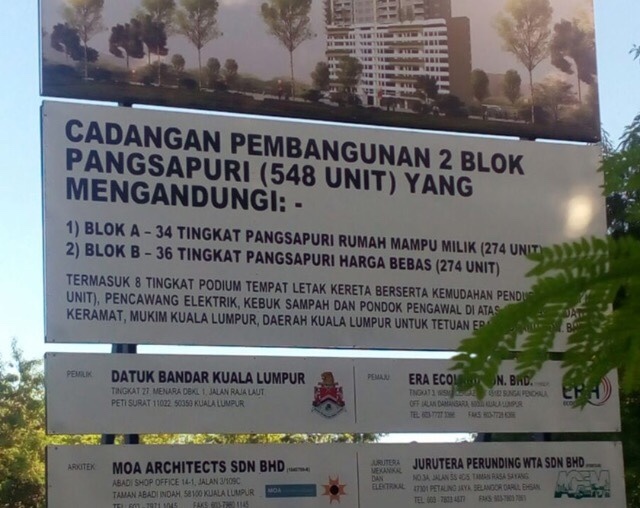 Except that the residents have, as their champion and defender, Datuk Johari Abdul Ghani, the MP of Titiwangsa and Deputy Minister of Finance. I gotta salute this YB DJ for his courage and tenacity. I really thought Umno had stopped making wakil rakyats like him anymore. But here he is fighting for the ordinary people against the system of which he is, like it or not, part of. Some people may say that it's DJ's job anyway as MP. What they must understand is that despite his position as wakil rakyat and deputy minister, the risks involved are huge. This is not a stroll in the park. This isn't a cheap publicity stunt. DJ can't afford to fail the residents, or what happened to Lembah Pantai may happen to Titiwangsa. I voted for PAS in the last 4 elections. But I am not really an opposition supporter if you asked me. It's just that I have a mental checklist of issues that I tick before I enter that polling booth. PAS happens to be part of that opposition block until recently. My additional yardstick is the track records of BN federal rule against recent years of Pakatan Rakyat ruled states. However, I am seriously considering voting Datuk Johari if he is still the Titiwangsa candidate in the next election. He has proven to be an excellent MP. Though having a corporate background I observed first hand how he has been providing excellent service to his constituents at each community and at every level. I expect him to follow the party lines in most instances but he is much much better than some of the half past six full ministers we have now. Knowing UMNO, I don't think he is one that will go far in the party as he doesn't issue maslan keruak type of statements. Mine will be an example of voting a candidate rather than the party in. "Keramat's residents are lower-income folks up against the Mayor of Kuala Lumpur and the mighty City Hall. And a newly-set up housing development company with purportedly no previous experience in building homes, which led people to smell something fishy about the whole thing." MRT Phase 3 given to most expensive tender (2 billion higher than the others), to a company with zero experience but access to the Bugis shoes for licking purposes. Just another shady deal in a history of them, dating all the way from Mindef, Scorpene and many, many others. now dah kecoh pasal 1MDB sponsor your bike trip with you & your friends. now change your tune on the postings ey. dah kenyang makan duit rakyat letewww..
tido nyenyak skang Bru. ramai org menyumpah ngan hang skang. It is Datuk Keramat vs Menteri Wilayah Persekutuan lah kawan. It is Datuk Keramat vs Menteri Umno lah kawan. It is Datuk Keramat vs Ku Nan MP Umno lah kawan. It is Datuk Keramat vs Najib's Minister lah kawan. It is just that you are scapegoating Datuk Bandar DBKL as the culprit lah kawan. 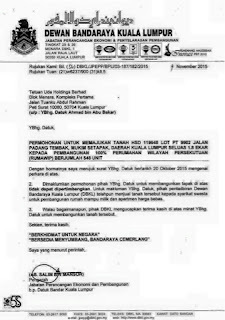 The Menteri, with the stroke of a pen, instruct DBKL to cancel the luxury project and award it to UDA for Rumah Mampu Milik. However, it looks like Menteri MP Umno that Najib produce will only develop Rumah Mampus Boleh Milik. Its never about DJ. He's only doing his duty. With this kind of Najib's administration, my home's 2 vote for Titiwangsa since 1986, will not go to Umno in GE14 is Najib is still around. This time, we have 7 votes from my home. Lagi 2plus years saja Rocky. Dah tak lama. Oh ya tolong check balik, BN won Titiwangsa by how many votes ini GE13. Sikit je kan. Before, they lost to PAS. With Najib, Ku Nan around, i think next time BN will be in for a thrashing in Titiwangsa. I live in Datuk Keramat. Will vote anything against Najib next time. I will still vote for BN bec dont like limkomunis taking over my kampong.. we all know who n what he is made off/from. Tertonggeng la you jika dap menang dia mmg heran dgn voting you dan tujuh org lagi. Lepas tu nak lawan pula d putra jaya. You takkan dapat kampong you balek. Jarum gigi kuning dah masuk. What la few millions for under people (orang bawah )to make when the boss is making billions.